It was less than 60 degrees in Downtown Pittsburgh Saturday but Mike Love — front man of the Beach Boys — was singing about breaking out the sandals and cruising past palm trees. The audience was nowhere near an ocean, yet Heinz Hall improvised by creating a sea of lights that instantly transformed a rainy Saturday in Pittsburgh into a starry evening on a boardwalk. The Beach Boys — who brought the surf rock and SoCal sound to the forefront of 1960s pop charts — are on a massive concert trek, known as the Wild Honey World Tour. Pittsburgh is their 95th date. Heinz Hall was treated to a whopping 40 tropical songs. How the band could muster the vitality to play such an enormous set list throughout six months’ worth of dates is nothing short of impressive. 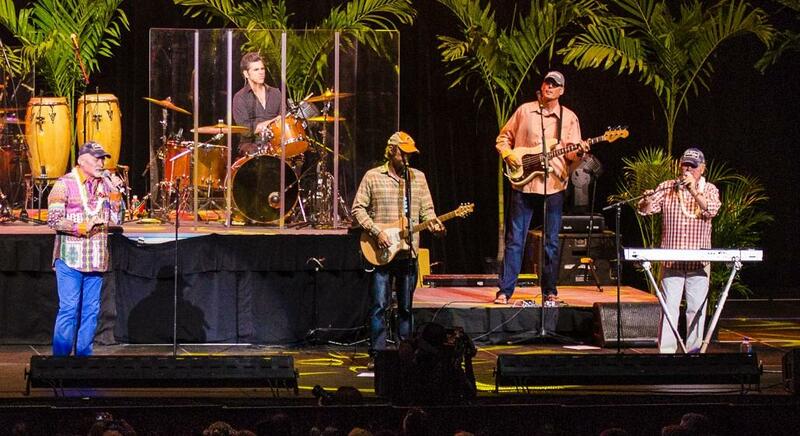 The Beach Boys’ lineup has repeatedly changed over the years as new members joined and others parted ways. Love, inherent showman, and his cousin Brian Wilson, the ingenious songwriter, cannot seem to put their differences aside in order to tour together. The group has split into two separate factions — Love with Bruce Johnston in one tour and Wilson alongside Al Jardine and Blondie Chaplin in another. Though a reunion tour would be glorious, Love and Johnston’s share of the band have proven they can hold their own. They still adhere to the original Beach Boys formula of divine harmonies and lyrics that document the flourishing lives of teenage Californians. They kicked off the luau with “Surfin’ Safari” — an eager invitation into the free and easy minds of West Coast loafers — performed as an inflatable beach ball made its way through the hands of fans. The Beach Boys cannot be dismissed as simply novelty music. Love’s voice has gotten a tad deeper, but he kept a warm tone while still reaching most of the higher notes during the performance. The crowd was stoked to hear all of the familiar seaside rendezvous favorites, but Love was determined to celebrate his new double album, “Unleash the Love,” released the day before. The throbbing “Do It Again” and forgotten classic “Getcha Back” are both revamped on Love’s latest album. Both recapture the Beach Boys’ essence and burst with fervor. Alongside Love and Johnston was a roster of six incredible musicians who have toured under the band’s name since 1998. On stage, it was apparent the two veteran surfers have gelled well with the more recent additions — so much so that Love encouraged guitarist Jeffrey Foskett to sing lead on the gleaming melody of “Darlin’” and Brian Eichenberger, originally of The Four Freshmen, to take command of “Then I Kissed Her.” Eichenberger’s vocals seeped with sentimental feeling. “This song reveals our fondness for the doo-wop genre,” Love said. They sailed into “Why Do Fools Fall In Love,” driven by an exquisite vocal arrangement they borrowed from Frankie Lymon and the Teenagers’ 1956 early R&B hit. Sticking with the subject of romance, the Beach Boys jumped into a brand new track, “All the Love in Paris,” topped off with oh-so-seductive saxophone, courtesy of Randy Leago. The band kicked into a prideful and swinging version of “Be True To Your School,” which motivated people in the balcony to start shimmying their hips. But a supercharged medley of “Little Deuce Coupe,” “409,” “Shut Down” and “I Get Around” served as an even more thrilling musical delight. After an intermission, Love and the gang picked up where they left off with “California Dreamin’.” It was marked by a slightly eerie vibe, but each band member vigorously worked to provide the tightest instrumentation of the night. Setting time for a couple tributes, the Beach Boys immortalized a founding bandmate, Carl Wilson, with a wistful “God Only Knows.” The song bled gorgeous sincerity as Love and Johnston sang with a recorded tape of their late guitarist’s vocals. And “Pisces Brothers” was a sacred homage to another old friend, George Harrison. Feeling a spiritual bond to lost rock icons is one thing, but “feeling the rhythm of a steel drum band” is entirely different. “Kokomo,” one of the group’s later hits, made for a picturesque performance — I half expected the ushers to start passing out hula skirts and Mai Tais. Somebody would have had to break it to Love that he was thirteen hundred miles away from the Florida Keys. And no Beach Boys concert is complete without hearing the memorable stutter of “Ba ba ba ba Barbara Ann,” which never gets old. Love invited a group of young girls on stage to help the band out — miraculously, the girls seemed to know almost every word, despite being born more than a decade after the song’s release. A high tide may only come every so often for surfers. But those attending this Beach Boys concert caught that perfect wave on the urban shores of the Monongahela River.